Duchess Kate visited Aldershot Barracks today to present shamrocks to forty members of the 1st Battalion Irish guards at their St Patrick's Day parade. It is a special day for the 30 year old marking her first solo military engagement. 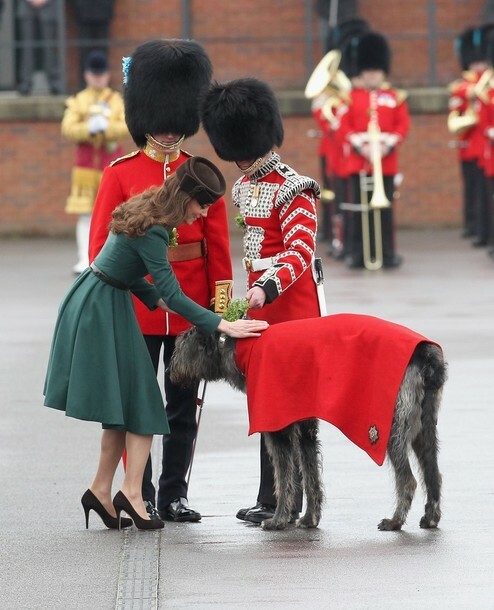 Upon arrival Kate was presented with shamrock. Queen Victoria formed the regiment in April 1900 as a sign of recognition of the brave acts carried out by Irish soldiers serving the British army. The tradition of presenting shamrocks goes back to the first regimental St Patrick's Day in 1901. The Queen Mother presented shamrocks for years and the regiment supplied pallbearers for her funeral in 2002. 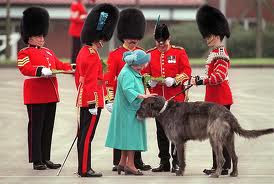 Below we see The Queen Mother greeting the guards mascot, the Irish wolfhound. The Duchess smiled and petted the six year old dog. The military band played the first few bars of God Save the Queen. Last year Prince William was made an honorary colonel of the regiment and wore his Irish guards uniform to the royal wedding. 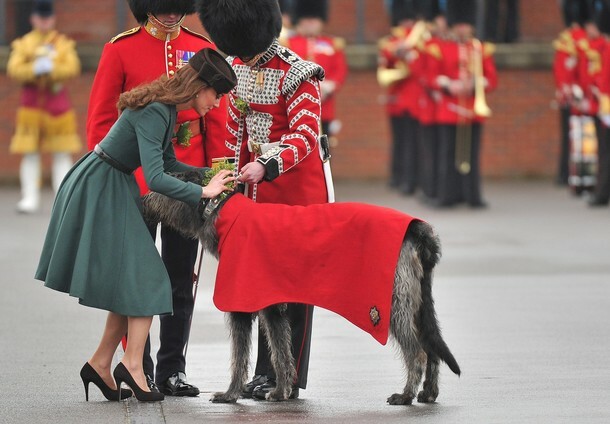 St. James' Palace said today would mark the beginning of a long-standing relationship between Duchess Kate and the Irish guards. 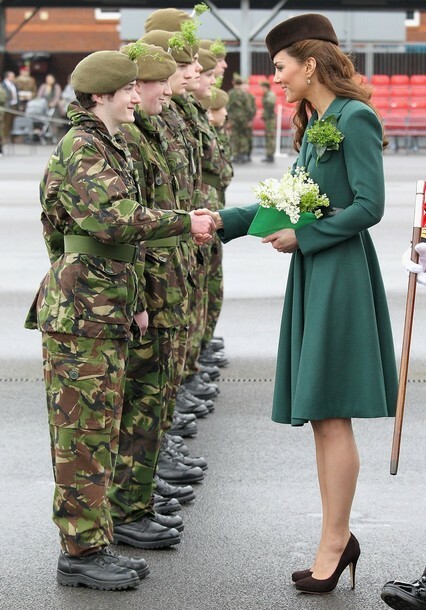 You can watch a video of Kate arriving and presenting shamrocks here and in the barracks here. The event was a little too overwhelming for one soldier who passed out during the parade. The papers reported it was a reaction to seeing Kate :) Perhaps not the legitimate reason but an amusing headline all the same. Kate enjoyed a glass of Harvey's Bristol Creme sherry in the Junior's mess at the barracks. 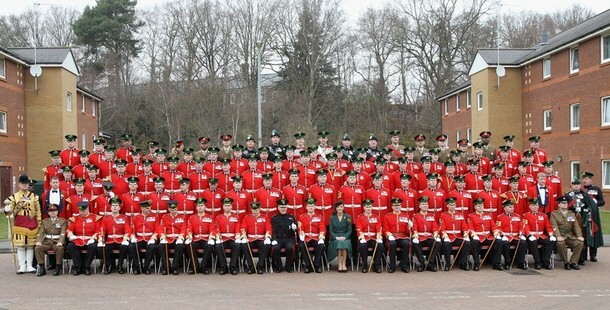 Kate and the regiment pose for the official photograph. We had all hoped Kate would wear green to mark the occasion and she didn't disappoint. Wearing a dark green coat dress by New Zealand born designer Emilia Wickstead. We see Kate's coatdress below from the 2010/2011 collection. (With thanks to Rene) Yet again we see Kate choosing a full skirt and emulating the fashion of the 40's/50's. A look at the back of the beautiful coatdress. Kate wore the Betty Boop hat by Lock and Co. It is available in an array of colours for £245. As you can see Kate opted for brown. The Duchess wore her favourite Kiki McDonough green amethyst 18ct gold and diamond earrings. An ideal choice for the day. Below we look at the citrine version. As expected Kate wore the shamrock brooch previously worn by the Queen Mother and Princess Anne during engagements with the regiment. Kate wore it last year for a military engagement. Kate's brown suede shoes are yet to be ID'd. What did you think of Kate's look today? Another great outfit! I like that she went with brown hat and not black, it creates more earthly feeling.Hair perfect too. I love that she dresses on her own and you can totally see it. She is classy but doesn't look like anyone else. The only thing I would suggest is some make up changes. She looks better make up free in my opinion than most times she wears make up. I can understand that it is hard to trust someone with your face but I would really give a try and allow a professional to do her make up, they way they do it for actresses in the USA for example. I too tought the brown hat was a great choice with the brown suede shoes. As for make up, I expect Kate still does her own, I wonder if she ever uses a make up artist. I hope she sticks with this 40's and 50's style clothing. It really suits her! It's very classic and you're right suits her figure perfectly. It looks to me like her makeup is a little different today - she almost looks a little like Princess Victoria in the second photo! Sarah - I'm so sorry about the inconvenience of not having anonymous commenting. I will reopen it for debate if the readers feel it's a loss. To be quite honest with you a couple of people posting 'anonymously' have been leaving such vile, nasty comments personally attacking me it got to the point where it was upsetting. Sadly people can be very petty. she sure does love the coat-dress look! I'm surprised we haven't seen more coatdresses on the high street bonnieux given the number of times Kate has worn them. I think that coatdress is tricky thing. It looks great for sure when you are going out somewhere outdoors and it's perfect for such an occasion. But as it fits really close to your body it doesn't allow to wear much underneath, meaning I don't think that they are that much practical for everyday use, like for work. You can't really fit a jacket underneath. Kate looked SO striking today!! That green (if that's what you call that color shade) looks lovely on her, & suits the dress design quite well! Lock and Co produce simply stunning hats, I think we are all hopeful Kate would wear green, so glad she did! She looks marvellous - just looks born to the role! Well done, Kate. Re: coatdresses - I had the same thought. They are so pretty and so elegant looking, but unfortunately just not quite right for normal work wear. I feel the same way about hats, living in the US. I LOVE Kate's (and most of Sophie's) hats (sadly can't say the same for Beatrice) - but I would look like quite the idiot walking around in one of those here. Random question for those of you in the UK: is it also considered a requirement to take off your hats whenever you enter a building? Here, hats are not allowed in schools at all (you may wear one to school, but it must be taken off when you go indoors). Thanks again Duchess Kate for all of your hard work! Gentlemen should always remove their hats indoors - although some different rules apply to the military but I dont know what they are. Ladies your comments are such a joy to read, one of the best things about this blog. Sarah - If you don't mind checking it again, If it's still not working please let me know. Thank you for your lovely comments today. And the hat was gorgeous today. It can be bought online in a variety of colours. I love this look. The color and style of the coat is so elegant. And the shape of the hat and the color compliments her coat beautifully. Kate has done fantastically on her own Royalfan. She really seems to enjoy being a royal so it's excellent to see. Loved the look - as with yesterday's - but why the towering heels? I mean, there are great shoes slightly lower that would still look great. Especially with the pink jeans. And I agree in makeup - less is way more for her and sometimes it seems a miss. I wonder how much tailoring/fitting she has done with her clothes - since she does buy off the rack. Thank you Alice you're so sweet, your blog is amazing. JB - Kate really loves her heels. I believe she's 5'10 so she must look incredibly tall. I agree that flats would have better suited the jeans. I concur about the heels, but what are our thoughts about her hemlines? She's wearing a longer hem today, and it seems much better. Much as I love her, longer is better in public, especially exiting cars. That teal suit with the queen for example, created some not so graceful pictures due to it's short length. No hate for Kate, but she needs to rememeber that longer equals more practical for her public appearences. Just a few extra inches, like on today's dress, really help her seem more polished and will allow her to be more comfortable in her movements, as she won't always have to watch her skirt. First of all thank you for such a great blog. I was here earlier and had problems logging in which is a shame because I wanted to congratulate you in being so quick off the mark getting this information on line. I think the Duchess looked very elegant today - loved the hat and the style/colour of the coat, which contrasted so well with the red of the Guards uniform. Apparently that brooch is the property of the Irish Guards and they determine who can wear it. The picture of the Duchess wearing it last year was when she and the Duke undertook a medal ceremony with the Irish Guards. I'm a complete sucker for tradition! That is interesting to know. I am a sucker for that kind of thing as well but I don't know much about it so please keep sharing your knowledge with the rest of us. Your blog really is fantastic! I visit every day since I noticed a few months ago that you post photos quicker than any Kate blog I've seen. I also enjoy your reports and when you give your thoughts. I love her outfit today! Such a beautiful silhouette for her. I especially like when she pulls back part of her hair, and of course anytime she wears hats! This hat was perfect with those new shoes. Finally I can comment again! Thanks for opening it back up but I think we would all understand if you wouldn't want to deal with the nasty comments. People can be so obnoxious. Anyways, I love the teal-like colours Kate has been wearing lately. Not a lot of people can pull them off without looking boring but Kate looks stunning as ever. Love the 40s/50s look. It is so chic and elegant. Maybe we will see more clothes in that colour in chainstores in the future if she keeps on wearing them. I agree on the make-up issue. I think there is room for improvement. I think the bold dark eyeliner on her lower lid looks quite harsh. But thats just my opinion and in the end I think it is remarkable that she has the guts to do it herself under such scutiny. Does anyone else think it is funny how people still refer to her as 'Kate Middleton'? I mean those name changes always take some getting used to but they've been married for almost a year. Its getting a bit inappropriate. I hope you all had a wonderful St Patrick's Day. Thank you all for taking the time to share your thoughts on today's visit. Sincerest apologies for anyone who couldn't anonymously post a comment earlier. Reading your comments is something I just love and I'm not going to close anonymous posting because of one very persistent troll. Hopefully that person will kindly stay away from this blog and allow the rest of us to enjoy discussing Kate's style and engagements. I thought today was great, Shame the weather was so dismal. Has anyone else noticed Kate really seems to enjoy royal duties which is lovely. Also, a huge thank you to all of you who participate constructively. Your comments are a very important part of the blog. I loved the pictures today. The Duchess looked beautiful and I loved the dress her hat and shoes. I do wish people would stop using her last name. She has been married almost a year now. She is the Duchess HRH and people need to remember that. She did a fantastic job today I hope the soldier who passed out is okay. He will never forget that! Thank you for your comments and a huge thank you to Cepe for the hat info! Kate looked wonderful in the green coatdress, I hope she starts incorporating more green pieces in her wardrobe, I think she looks wonderful in green! Love the hat also. Thanks for posting great photos and coverage of Kate's appearances! I really liked this look and a special high five for the hair under the hat! LOVE the hat! Kate has come into her own during these solo engagements while William is away. It's such fun keeping up with her through this wonderful blog. I love the ties she is establishing with the military & the memory of the Queen Mum. Can't wait to hear her speech tomorrow. I hope you find video! Do you know what time the engagement is tomorrow? I have a query - is the Duchess wearing a coat or a dress. I have heard it described as both or these as well as "coat-dress". I think it is a fitted coat but would really like to know. Hi Anonymous - It is a coatdress for certain. LOVE this outfit! love the fitted bodice and full skirt style, the heavy pleats, the hat - so perfectly perched, and not too big, not too small with neat detailing on the side, shiny patent belt, great skirt length, nice shoes, gold brooch, great hair style, pretty makeup - love it all! Thankfulness to my father who told me on the topic of this webpage, this website is truly amazing.